Subscription Plugin for WooCommerce is one of the best plugins that can integrate a subscription model eCommerce into your online WooCommerce store efficiently. This article elucidates the main features and how to successfully set up the WebToffee Subscription Plugin For WooCommerce. Subscription-based eCommerce site provides it’s users with the choice to get their required products (Eg: common use items, Subscription boxes, Services etc) set up in specified intervals(daily, monthly, yearly or seasonal). Subscription plugin for WooCommerce is an ideal plugin for creating simple subscriptions on your store. Like any other WooCommerce products, you have the option to create Subscriptions out of physical, virtual or downloadable products. This plugin is compatible with most of the WooCommerce add-on plugins like WooCommece Membership plugin, Stripe etc. Once you have installed and activated this plugin, a new section will be made available in the WordPress menu titled WebToffee Subscription. After installation of the plugin when adding new products to your WooCommerce store, you will get two additional product types in the Product data drop-down list as Simple subscription and Variable Subscription. 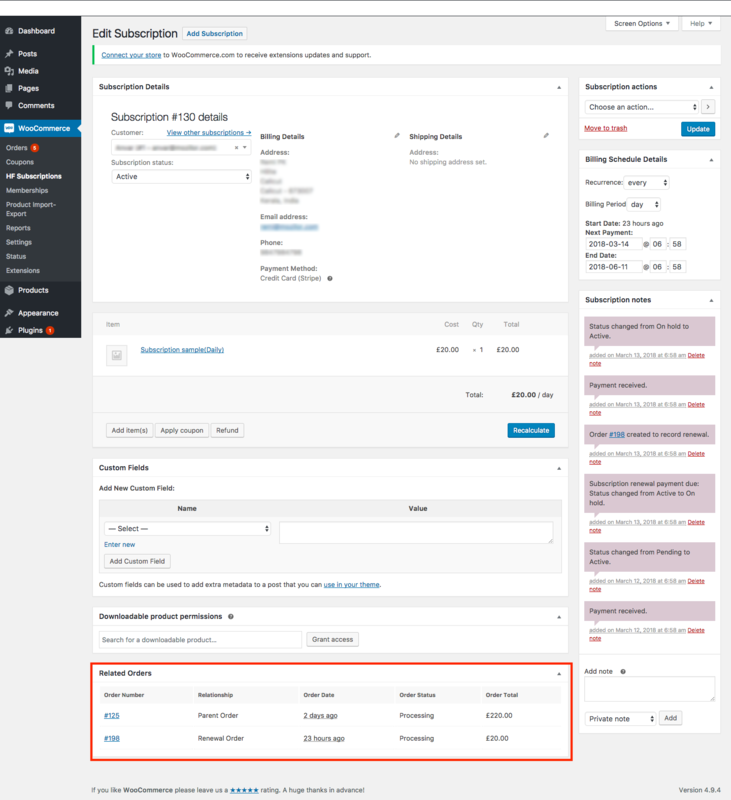 When you select the product type as Simple Subscription, you will have options to state the subscription price, subscription interval, and subscription length. By choosing Variable Subscription product type, you can create Variable Subscription products with corresponding attributes and variations suiting your business requirement. 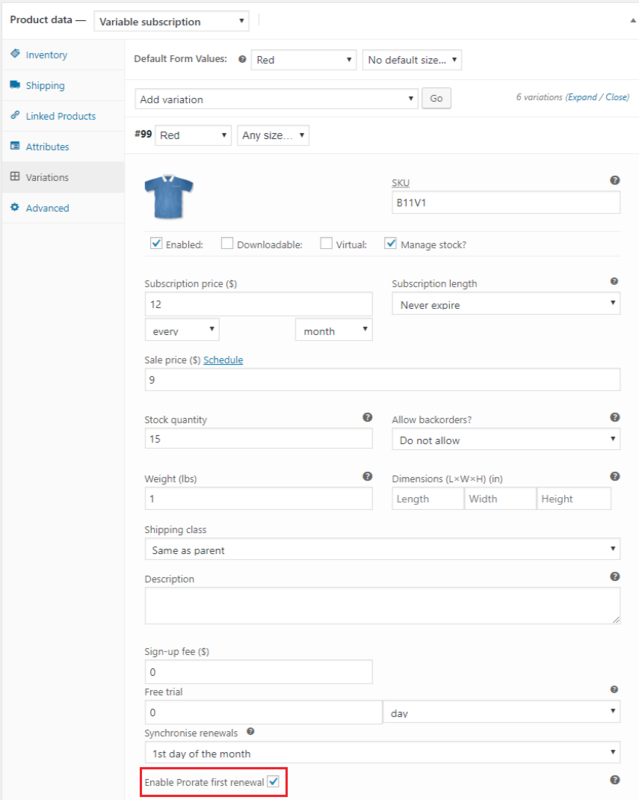 Under WooCommerce settings > WebToffee subscription tab, you can manage the text displayed on the front-end for My Account Tab Title, My Account Tab Text, Add to Cart Button Text and Place Order Button Text. Check the Allow mixed checkout tick-box, to enable subscription products and normal products to be purchased together. 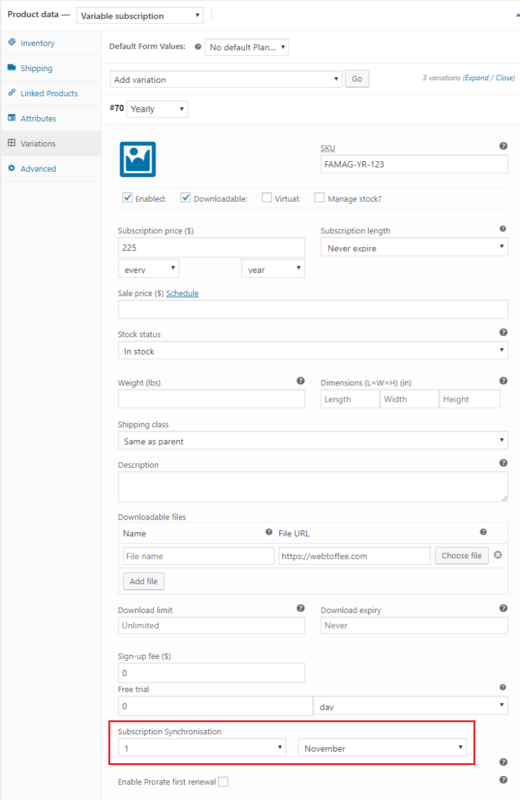 After purchasing the Subscription Plugin For WooCommerce by WebToffee, the plugin will be available as a zip file in the API Downloads section of your MY ACCOUNT page. Note: Please uninstall the basic version (in case you have it installed) prior to installing the premium version to avoid any conflicts. Subscriptions for WooCommerce will add a new menu called “WebToffee Subscription” under WooCommerce menu. There, you will find all the subscription orders. Once you have installed and activated this plugin, a new section is available in the WordPress menu titled WebToffee Subscription. To add subscription products to your WooCommerce store, navigate to Products > Add New from your WordPress dashboard. It will take you to the product editor where you can enter details about the product. Once you give the product name and the product description, select the Simple subscription from Product data drop-down list. You have options to choose either virtual, downloadable or none of the two. Enable both virtual and downloadable boxes for an item, if you do not want to sell it as physical. Subscription Length: Specify the time period after which the subscription automatically expires. After entering all the other details in the related fields(Inventory, Shipping, Linked products, Attributes and Advanced)just like the other products in WooCommerce, Publish the product and it will be visible on the product page. Once you give the product name and the product description, select the Variable subscription from Product data drop-down list. Click on Attributes tab to add product attributes.You can specify the attribute which will vary the Subscription of the product. It can be anything from the color of the product to size, edition, license items, etc. After successfully adding the attributes, click on Save Attributes. The attributes created will be saved under the product name. After creating Attributes, click on Variations tab to create Variations to the product based on these attributes. You can also select/add Product categories, Product tag and Product image, which can be seen on the right-hand side of the page. 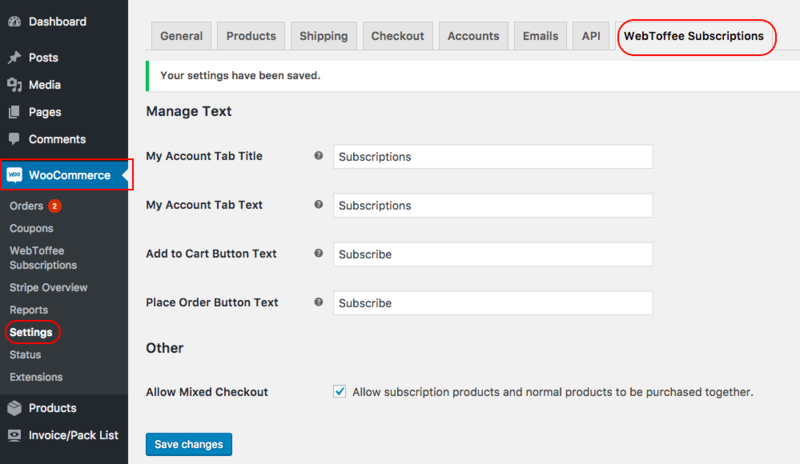 Navigate to WooCommerce > Settings > WebToffee Subscription. This section helps you to manage the button text displayed on the Subscription listing page, Product page and Checkout page. 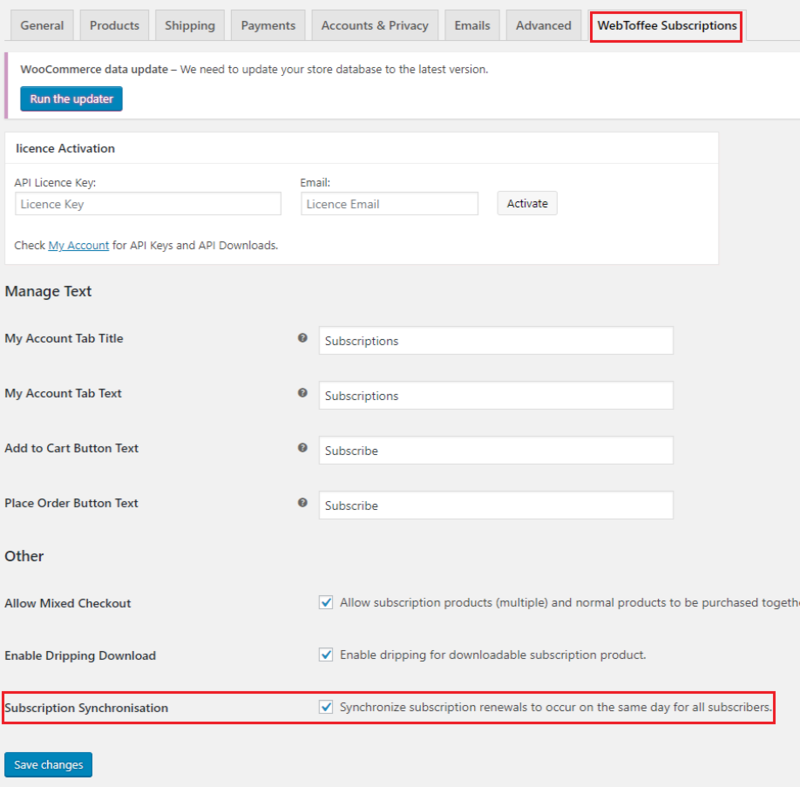 My Account Tab Title: Specify my account tab title(as defined by you) button for the subscription listing page, which will be visible on the My Account page of your WooCommerce store. My Account Tab Text: Enter my account tab text(as defined by you) button for subscription listing page. Add to Cart Button Text: Enter the text to be displayed for add to cart button. Customers can see this button on the Product page of your WooCommerce store. Place Order Button Text: When an order contains a subscription, the text specified in this field will be displayed on the checkout page. Allow mixed checkout: Tick this check-box, to allow subscription products and normal products to be purchased together from your WooCommerce store. Once all the required changes are made click Save Changes button. Once all the required settings are done, the subscription products you added will be visible in your WooCommerce store along with the other products. Customers can now search and add the products they want to subscribe to their cart. Like any other normal WooCommerce products, the details along with the price will be listed on the product page. To place an order, customers need to click on the product and select the number of products they want to order on the cart page and then click Proceed to checkout. In the checkout page, the shipping details and the method of payment can be mentioned. After successful payment, you will receive the order and billing details. Once the order is placed the related subscription can be viewed in the WebToffee Subscription section. The related order(Parent order and renewal order) details can be viewed on the Edit Subscription page. Below given are some of the main features of WebToffee Subscription plugin. Display subscription products along with individual products on your Shop page. Your customers can choose to opt for a subscription according to their preference (based on the subscription plans that you set up). However, customers need to register on your store to initiate a subscription. Renew subscriptions automatically or manually. Please note, automatic renewals will be dependent on the payment gateway that you choose. Synchronize your subscription renewals for weekly, monthly, or yearly subscriptions and the option to choose proration of the first payment of the synchronized subscription. This plugin supports recurring payment. Since recurring payments are bound to repeat after completion of a billing cycle, Subscriptions for WooCommerce plugin makes sure a new order is placed as soon as the due date is reached. Allow customers to cancel their subscriptions from the ‘My Account’ page. Customers also have the option to change the shipping address if required. Please check out the product page for more understanding of the plugin features. This entry was posted in Documentation, Getting Started, Subscriptions for WooCommerce. Bookmark the permalink.